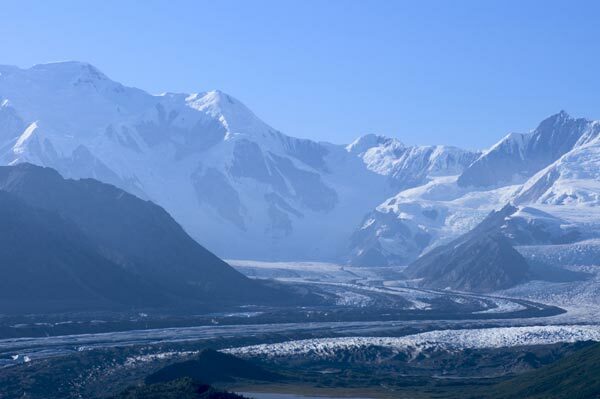 Kennicott Glacier flows south from the Wrangell Mountains in Wrangell-St Elias National Park. The hike starts with a van through the spectacular scenery of Thompson Pass with Worthington Glacier dominating the landscape. At the Worthington Glacier State Recreation Site an experienced guide helps participants strap crampons on their shoes, then its time to hike and explore the crevasses and sculptured ice. After a lunch break, the hike heads further up the glacier to take in intricate ice formations and expansive views of the Chugach Mountains. With over 20,000 square miles of roadless wilderness, flying is an incredible way to see and experience the wonders of the beautiful park. The tour’s first stop is the frontier town of McCarthy. The copper mines in the area produced over $207 million before they were abandoned more than 100 years ago. The post office, saloon, and many of the original structures still stand. Next, stop for lunch in Kennicott and tour the copper mine. Visitors will learn about one of the richest copper discoveries in history and hear stories of how people lived and worked in this remote, mountain wilderness. Novice or professional, take a half or full day floating trip down the scenic tributaries of the Copper River and fish for world famous, trophy-sized salmon. Your guide will take you to either the Gulkana or Klutina Rivers. Depending on the season, visitors can fish for king or sockeye salmon. The excursion includes fishing gear, a personal floatation device and food. Caught fish can even be processed, frozen and shipped. Meet a local musher and his dog sled team and learn how dogs are kept in shape during the summer months. Native Alaskans used dog sleds to haul food and to pull heavy loads. During the gold rush, dog sleds brought much-needed supplies over mountain passes and glaciers. When winter’s over, mushers use wheeled carts to keep their dogs fit for winter sporting events and everyday transportation. After a brief demonstration, visitors can experience the strength and enthusiasm of the dogs and take a ride through the wilderness. For more information on these activities, visit our Copper River excursions page or call 1-800-426-0500.